While synthetic marijuana shares a common nomenclature with cannabis, they are two vastly different drugs; the former having a host of unpredictable, terrible side effects, some of which are potentially life threatening. As the nation becomes more tolerant of cannabis use, health experts and law enforcement officials have become intolerant towards synthetic marijuana. 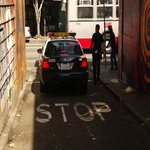 The move from shop windows and online stores to the streets makes it much more difficult for law enforcement to police, according to the article. It is no longer a game of fining shop owners and shutting down websites; street busts will now be required which is exceedingly more difficult.